Gaming the System: Designing with Gamestar Mechanic orients readers to the nature of games as systems, how game designers need to think in terms of complex interactions between game elements and rules, and how to pull out systems concepts in the design process. 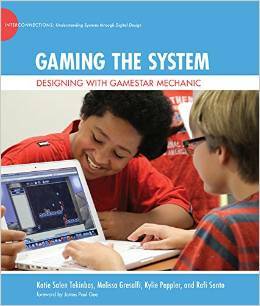 The core curriculum uses Gamestar Mechanic, an online game design environment with a strong systems thinking focus. Share work created from Gaming the System at Edmodo and at forums such as Instructables and DIY.org. Learn more about systems thinking and design with Water+ (created for Interconnections in partnership with Carnegie Mellon’s Entertainment Technology Center students “Team GameGrid“).